This Keto Sausage Balls recipe is a family favorite and we make them all the time, but especially around the holidays. We know you will love these as much as we do, which is why we had to share them with you. This Christmas will be the second year that we have to face the holiday without my mother in law. Beverly was like a mom to me and this time of year is bittersweet. One of the things I loved about the holidays was her cooking. She would make the most wonderful and delicious foods. She had a few traditional foods that she made every year (foods that were not a tradition for me growing up). I will never forget how excited I would get every year when I would go into her home and realize that she had made me my very own dish of pistachio salad. Much like the peanut butter balls, pig pickin’ cake, and sausage balls I had never had any of these dishes for Christmas until she came into my life. I only had pistachio salad when she would make it for me so every year I would forget about it, but she always remembered. Bev is one of the most beautiful and amazing women I have ever had the pleasure of knowing. Today this keto sausage ball recipe is in memory of her. Can’t eat Almond Flour? No problem! 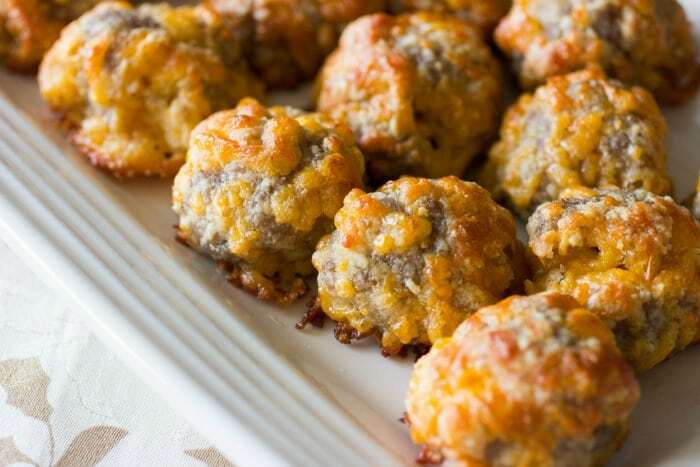 Try out Keto Coconut Flour Sausage Balls Recipe here! Looking for other holiday recipes like this one? Check out these cookbooks! I own Sweet & Savory Fat Bombs and it is full of delicious recipes! Store in a sandwich bag or covered bowl in the fridge. My mother in law would leave them sitting out at room temp, but I just can't do that. Do you have a favorite family recipe that you only eat during the holidays? Share it here, I would love to try it! So good! Tender and moist...way better than the traditional sausage ball made with biscuit/pancake mix. This is going into the permanent breakfast rotation. Thank you! Thank you so much for this recipe! I might have missed this somewhere but is 1 serving = 1 sausage ball? Thanks! That's my ? What makes a serving? Sorry yes, 1 ball is 1 serving! Editing that now! Can you post the sausage ball recipe? Can you make them withoutthe cheese?? Hi Barbara! You can try, but you may want to double up on the butter so they aren't too dry. Let me know if you try it and how they turn out. Wondering how these turned out with no cheese? Would like to cut this down to less cheese but don't want to waste the other ingredients if someone else has already attempted. Made these this morning... DELICIOUS!!! Hi. I have a sensitivity to almonds. Do you think another gluten-free flour substitute could work with these? Possibly coconut flour, but I will have to try the recipe before I know how it tastes. I will get back to you on this! I just made these for my family and all six of them loved them! That's rare for my picky eaters (my husband included). Can I use flax meal instead of almond flour? Made these tonight they are so damn good thank you! Can I sub Coconut flour dor Almond flour.. These are so delish and an easy run-out- the-door-to eat-in-my-car-quick-breakfast. My concern, and I hope I'm just reading this wrong, but there can't possibly be 124 calories in one ball, can there? What size ball are we talking here? The ones I made were just small meatball size. I have been eating four at a time before I saw nutritional content. What size is the calorie/carb count based on? I put all the ingredients in MyFitnessPal and made a recipe of it. I used the ratio of 24 balls per the recipe. It has 113 calories per ball and .7 carbs per ball. I'm sure it's all the cheese and fatty sausage causing the high calorie count. This is a great recipe for those eating low carb though. Looks yummy. Can't wait to make it. I have a question, I am not a huge parm cheese fan, what could I substitute for that? These were wonderful!!! Thank you for the recipe! This is probably a dumb question, but I am not that great of a cook. I have to follow the exact recipe LOL.. Does it matter of the butter is melted or not? That's not a dumb question! I do usually melt the butter for this recipe! Thank you! I made them today and they don't look as golden as yours. They look more like hamburger meatballs. LOLOL!! They taste great though. I take mine out at about 13 mins and let them finish cooking on the hot cookie sheet. I have a really hot gas oven. Has anyone tried crushed pork rinds instead of almond flour?? I used crushed pork rinds for a batter on chicken and pork before frying. Found the recipe online. Have not tried it to replace almond flour. These are really good. I will definitely be making these again, and again, and again. So I refuse to pay for almond flour, that being said this is how I made them. I added a pound of turkey italian sausage and doubled everything else except the cheddar cheese, topped with keto marinara sauce and mozzarella cheese. They were really good, a little salty probably because of the sausage. I will definitely make them again. Thanks for the recipe! I thought they were good but way to salty for me... I am on a salt restricted diet so my questions is does it have to have the 1/4 tsp salt. I think the grated Parmesan is salty enough. I find recipes using it salty. It makes a big difference when you are not use to eating hardly any salt. I use garlic powder instead of salt. Dumb question....you don't cook the sausage first, right? I'm about to make these, and it looks like raw sausage in your pics, so I'm assuming it's like a meatloaf mixture! Right! The sausage is raw. Sorry I've been out for a while and just saw this. I'm sure you've made them by now, hope you enjoyed them. Do you brown your breakfast sausage first? Or do you mix it with the other ingredients in raw form? The sausage is raw when it goes in the oven. Has anyone froze these after they were baked? Looking for things to send with my son to college for a quick breakfast? Thank you! Hi Kim! These are great for freezing and eating later! I think I know the answer to this question, but I just want to be sure. Do we use the grated parmesan cheese than comes in the jar with a green lid? (Kraft does anyway) Or is this fresh grated cheese? You can use either. When I'm in a rush I use Kraft, when I have extra time I use the fresh stuff because it tastes so much better. So excited to come across this recipe.!! I'm not a fan of parmesan cheese can I leave it out or subsitute it for something else? Wonderful, first sausage balls I've ever really liked. Thanks for this recipe! I've made these several times and they're a hit with our keto and non-keto friends! The first time I made them according to the recipe, but I've been omitting the butter/coconut oil ever since because they were too mushy/oily. Perfect consistency without the butter/coconut oil! I was so excited to try these - and made them this morning. I laid out all of my ingredients and started adding them to the mixing bowl. However, I got to the "8 oz cheddar cheese" and thought it said 8 oz cream cheese. I misread it twice! Went over to my fridge and pulled out cream cheese. Mixed it all up and realized my mistake. Rather than throwing out the batter, I quickly doubled the recipe so that I was only adding 4 oz of cream cheese to the recipe. Baked them, and crossed my fingers that they would come out ok. And boy were they delish! Melt in your mouth good! I have a ton of sausage balls to eat before I can try the original recipe. But wanted to share - in case anyone wants to throw a little cream cheese in theirs. So good! These were really good - my husband loved them. I did add a little crushed red pepper as we like things spicy. I do think instructions should say to turn the balls over half way through cooking. Mine did not brown on top after 16 minutes. I did turn them over at that point and cooked for another 4 minutes, but think they were a little over-cooked. We had them as a dinner with a veggie side. Awesome!! I accidentally used mozzarella instead of Parmesan but they delicious anyway. I’m Looking forward to making these for my Christmas Eve party. Thank you!! I made this recipe this morning. I used fresh grated cheddar, since pre-shredded cheddar in the package has added hidden carbs (corn starch). I used a table spoon scoop and was able to get 37 balls on to my pan. Can't wait to pull them out of the oven and try them! Sausage balls are a MUST on Christmas at my house. Going Keto is not going to change that! How many of these do you usually eat at a time? I am new to Keto so I am still learning the process. I made these for a watch party last night because several of us are following Keto and they were a hit! I made half in the oven and half in the air fryer. Delicious!! The air fryer helped them keep their shape where the oven ones had a crispy cheese bottom. Both were awesome! Thank you for the recipe! I used 1 lb of Tennessee Pride Hot Breakfast sausage and a pound of ground beef and just doubled everything else except maybe a bit less on the salt and baking powder. Came out great!! What a great snack right out of the fridge!! We loved this recipe! Made oversize rounds and cooked in the air fryer for 12 mins at 370. Delicious! Thanks for the post! These are the best snack. Just made them and they are delicious. Thanks for sharing. Seems to me that this recipe would make an awesome sausage pizza crust! Has anyone tried this? Thank you so much for this recipe! I added a little cayenne for a touch of heat. I liked them better than the ones I grew up eating with Bisquick. I've been needing Keto comfort food and this hit the spot. These are wonderful! I skipped the parmesan simply because my tiny kitchen was full of stuff and my tired body didn't want to deal with it LOL! My husband, shortly after them coming out of the oven, asked if he could start eating them. I said yes and a moment later he walked into the living room, mouth full, with one in his hand and said "you need to eat this....now!" I kept saying "I'm glad you like them" he replies "no you don't understand, they're amazing!" So thank you for making him happy! Will definitely be making again!